In a genuine bad blood match-up that had been preceded by plenty of trash-talk and a near brawl at the weigh-in, unbeaten 140 pounders Josh Taylor and Ohara Davies engaged in a battle that lived up to the hype last night. Taylor, 9-0 going in, proved too tough, too clever and too good for Davies, 15-0 going in. The fight in Glasgow, Taylor’s home town, was eventful though. Southpaw Taylor, seen by many as a definite world champion of the future, decked the cocky, arrogant Davies in the 3rd, and it looked for a time as though the fight would end quickly. To his credit, Davies, talented in his own right, fought back bravely, having his moments in the following rounds. 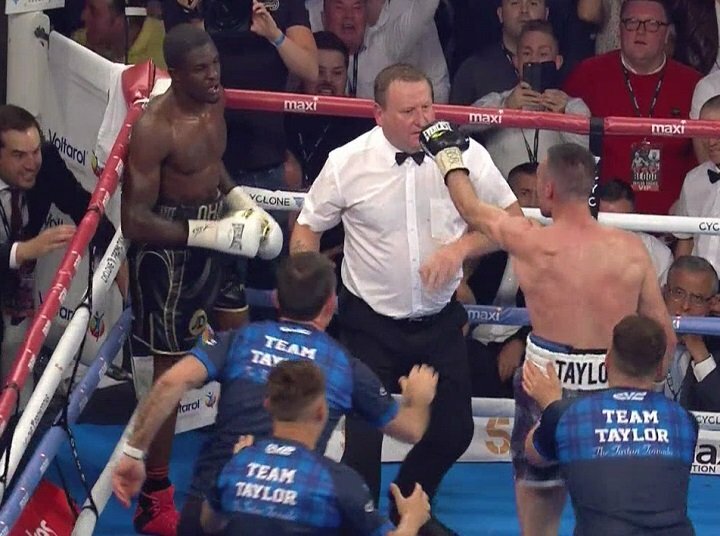 But in the 7th, courtesy of a cracking right hook, Taylor had his man down again. This time, in surrendering when in obvious pain, Davies had had enough. The ending came at the 2:24 mark of the 7th. The sky really is the limit for Taylor, guided as he is by former world champ Barry McGuigan. Satisfied at having closed the mouth of Davies, Taylor is eyeing a possible big Scottish showdown of a fight with former three-weight ruler Ricky Burns; who called the fight for Channel 5 in the UK. “He can fight Ricky Burns and the winner fights for a world title,” he said. Is Taylor, at just 10-0(9) ready for the experience and class of Burns? It would perhaps be a risky step up for Taylor but he does look ready for it. Burns has a possible fight with Anthony Crolla in the offing but he said last night that if a serious offer is made, he would definitely look at facing Taylor.